The Hospital in San Juan del Sur is Finally Open!!! – The new hospital is finally open and I enjoyed a private tour with a few clients and our in house photographer. There are many services available in this 40-bed hospital, with shared and private rooms. Click on the blue F to view the rest of the photos. New building at Nicaragua’s border with Costa Rica. Finally…a decent entrance to our country! If you always go to Managua by passing through Masaya, you haven’t seen the massive improvements to Route 2; widening it from a very narrow 2 lanes to a massively wide 4 lanes!!! Take a different route and check out the almost finished work. There are still some areas where they are paving one lane or where you have to drive on 100 meters of unpaved road, crossing culverts still under repair, but for the most part, it is 4 lanes of smoooooooth new pavement! The beautiful drive to El Cucero, where you can see all the way to the Pacific Ocean from atop the mountain and enjoy the fabulous valley views on the way back down to the west side of Managua, where the road connects with the Old Road to Leon, is an absolutely beautiful drive! Just don’t drive it at night yet since the road is mostly still without lines. Finally a new development, that started moving dirt, paving roads, and creating a grand entrance about 2 months ago, has plans for a marina!!!! This massive project on the Nacascolo Bay is nestled between Pacific Marlin to the south and Cala Azul to the north. The 81 manzanas will be developed in two phases, and plans include a marina which is now proposed for the south side of the bay where they will have more space for a larger marina due to the amazing demand before its even started! They will also have a boardwalk with food and beverages, shopping, horse stables, a hotel, camping, etc. Contact me for more information or opportunity to buy a lot, build a hotel, or open a restaurant!!! San Juan del Sur and the surrounding area has Fiber Optic Internet with 110 Channel IPTV!!! Contact Ernesto Lacayo at HSS (Hotel Software Solutions) for Fiber Optic Cable with up to 1 Gbps Speed (I only have 3 Mbps which works great), IPTV in English or Spanish with all the major USA network channels, and Surveillance Cameras for security too! Tell Ernesto I recommended the service! Medical tourism can save you money on procedures and give you a vacation all in one! Call or email Dr. Cora at SunCare Dental Clinic in SJDS for ALL your dental needs, including implants, at very affordable prices! Tell her you saw it here or on my Discover Facebook Page! Looking for a rental for your next vacation or looking for someone to promote your property for rent? Check out our rentals page on our website. Here is one of our favorite houses, Casa Morada, which features a MASSIVE swimming pool and open air living! Do you own property in Nicaragua? I highly suggest preparing a Nicaraguan Last Will and Testament! If you leave this world without one, it can be very difficult and expensive for your heirs to take possession of the property that is rightfully theirs. Sergio Corrales Montenegro, with offices in San Juan del Sur and Managua, will be happy to help you prepare this simple document for you protection. Several volunteers take in abandoned kittens, feed them, and then find permanent homes for these little angles once they are on solid food. If you are a lover of cats please bring some Kitten Milk Replacement Formula with you the next time you visit SJDS and I’ll get it to the volunteers in need! If you have visited any of these countries, and you are traveling to Nicaragua, you must have a certificate proving you have been vaccinated against Yellow Fever or you will be denied entry into Nicaragua!!! Argentina, Bolivia, Brasil, Colombia, Ecuador, French Guyana, Panamá, Venezuela, Paraguay and Perú. The restriction also applies to all African countries, except the Democratic Republic of the Congo, Tanzania, Sao Tome, Principe, and Somalia. The certificate must be by the registered health authority of the country of origin and must be valid for at least 11 days prior to entering Nicaragua. For more information, click here. For more articles, photos, videos, and important information about Nicaragua, visit our Facebook page! Below are just a “FEW” of our almost 300 listings! Type reduced in the key word box and quickly find all the bargains on our website. In addition, type in bargain as the key word too since some properties were bargain priced from the beginning! The Cala Azul residential community has been busy widening roads and making major improvements to the infrastructure! Let me show you around the next time you visit because it borders the north side of the new marina project!!! Cala Azul is the perfect place to buy a lot and build your dream home or buy one of the soon to be constructed condos or townhouses and have easy access to all the amenities of the new Marina project!! Malibu, a luxury community, located in Pacific Marlin has reduced the prices on several styles and types of units! Contact us for more information! Their largest townhouse has just been reduced to $365,000 from $559,900!!! The Brisas del Pacifico Development is situated on a hillside right above town, and has spectacular views over the Bay of San Juan del Sur. This gated development with paved roads has easy access from town and is within walking distance to all the amenities San Juan del Sur has to offer. $79,000 Reduced from the already bargain price of $88,000! Las Escaleras Lot #2 is a huge, nearly 2 acre, hilltop lot. 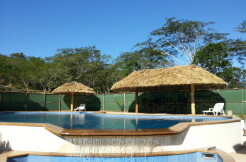 Located just 3 minutes outside of San Juan del Sur, this lot is in a quiet rural area. The hilltop plateau of 7,559.73 m², or 1.07 manzanas, is one of the few places left to build with such amazing views. From here, you will enjoy a 200-degree view of the surrounding valley and the San Juan Del Sur bay. Just near the driveway at the top of the plateau there is a picturesque iconic Jicaro tree, distinctly shaped by the ever-blowing off-shore wind. $90,000 Reduced AGAIN from $200,000!! Owner will co-develop with the right partner!!! Large 118 acre farm for sale on the main highway just outside of San Juan del Sur. Featuring beautiful views of Volcán Concepcion on Isla Ometepe, the property with a 4 bedroom house has unlimited potential. The property has several acres of precious hardwoods, including oak trees. A creek runs throughout, and you’ll find an abundance of lush vegetation, pastures, fruits trees, and howler monkeys. An arctician well provides water to 3 large cement tanks – it never lacks water! Villa Mare is a beautiful 5 bedroom house for sale in the Pacific Marlin development, in San Juan del Sur. The first floor is wheelchair accessible. Built in 2018, the entire house of 620 m² has an elegant modern feel. Enter the house via an extra wide door. Here you will find a spacious living area with seating, a bar, and floor to ceiling sliding glass doors. The doors slide all the way open, creating an open air living space that looks out across the yard, pool, and beyond to the ocean. Built with the old Nicaraguan farm houses in mind, the kitchen and dining area is completely detached from the main house. Accessible via a covered ramp, the spacious kitchen is equipped with modern, stainless appliances. A large island counter and an abundance of seating makes this the perfect place to host cooking classes or events. The dining table seats 8, and the wrap around bench seats another 8. A side door leads out to a small balcony with an outdoor dining area and BBQ Grill. This is a wonderful spot to enjoy your morning coffee and breakfast. Hotel Villa Isabella is a gem waiting to be polished! An intimate hotel located in the heart of San Juan de Sur with easy access to all SJDS’s amenities. This nine-bedroom nine-bathroom hotel and four privately owned 2 bedroom condominium apartments was built in 2000 and remodelled in 2010. This hotel features all 9 rooms with a private bathrooms, quiet air conditioning, hot water showers, bath tubs, cable TV, wireless internet, and DVD players with a large selection of movies in English and Spanish. Also available are 7 off street parking spaces in the warehouse next door that houses the generator. 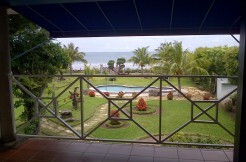 Private hillside house for sale on Buccaneer’s Point in Tola. Overlooking the beautiful Redonda Bay, this 2 bedroom, 2 bathroom house has good rental potential. Wooden accents are found throughout the house, giving it a rustic yet modern feel. Outside, there are large wrap around patios on both floors providing an abundance of outdoor living space to enjoy the panoramic views. Redonda Bay is a quiet beach located around the point and within walking distance to the small community of Playa Gigante in Tola. Finquita (small farm) Escamaquita is located before the entrance to Playa Yankee on the road heading to the southern beaches and the future coastal highway! This farm or finca as called in Nicaragua is perfectly positioned to take advantage of the upcoming improvements to be seen when the coastal highway is open. Ideally located you have easy access to several beaches and the town of San Juan del Sur. Open your own surf camp with lots of space to spread out, run a gentleman’s farm, start an organic farm, expand on the couple hundred trees that were planted in the spring of 2017, ….the options are endless! A great bargain in the Yankee area. Rojo Loco, the successful beachfront bar and restaurant located in San Juan del Sur is for sale! Don’t miss out on this great investment opportunity! Located right on the beach, this is a business that is full of potential. The current Tex-Mex style food has great reviews, proven on Trip Advisor and Facebook. The entire premises has the capacity to seat 70 people, plus extra room for more on the couches. The large bench style seats at the tables allow lots of room for groups and the bar seating along the beach is one of the best places in town to watch nightly sunsets that never disappoint! The beachfront location provides lots of room for kids to play making it a great family friendly environment. The designated stage area is perfect for hosting successful theme nights and events such as games nights, karaoke, and live music. $55,000 Reduced AGAIN from $80,000!! 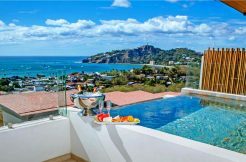 The Socialhouse is a recently renovated 3-unit apartment building for sale in the heart of San Juan del Sur. The ideal location of this turnkey property being just a short walk to the beach and restaurants makes for great rental potential – any investors dream! The building features 3 modern air conditioned studio apartments, as well as a rooftop patio and plunge pool. The apartments are simple yet tastefully finished with polished concrete and colorful tile accents. The apartments are furnished with everything needed, included stainless steel kitchen appliances, cutlery, flat screen TVs, and brand new beds. The entire building was remodelled in 2017, and repainted again in May 2018. $199,000 Reduced AGAIN from $349,000!! If you don’t see what you are looking for on our website, please email us! Cheers from sunny San Juan del Sur! La Santa Maria – A Paradise in the Making!